Walk the same decks as British sailors supporting troops during D-Day with a visit to the HMS Belfast, a hands-on piece of naval history floating in the centre of London. Our family testers climbed aboard, and up, and down, and all over the huge ship and still have more to see on the next visit. Elizabeth Leight visited HMS Belfast with Robert, 5 and Bryony, 2. 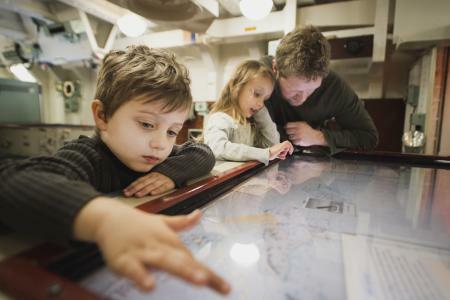 Put yourself in the place of WWII British sailors by exploring the decks, guns, sleeping quarters, engines and control rooms of the HMS Belfast, one of only three surviving bombardment vessels from D-Day. Launched in 1938, the HMS Belfast served 24 years of active service spanning both World War II and the Korean War. After a passionate campaign to save the ship from being scrapped, in 1971 it was opened to the public from a berth on the Thames in London. 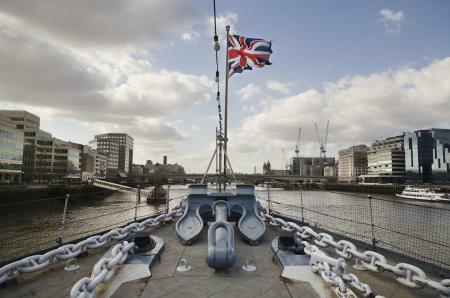 Now a stately 80 years old, the HMS Belfast is a landmark that all ages can enjoy. The whole ship is a treasure trove of nooks and crannies to explore, with wide decks to release energy. My two-year-old loved the different sights and sounds, as well as waving to the boats going past us on the Thames every time the path through the ship led us back outside. On the practical side, you need to be prepared for a lot of carrying. The primary way to get around the ship – and the only way to really see everything – is by steep sets of stairs that you have to descend facing backwards (called face ladders). A confident four-year-old would probably be able enough to navigate these themselves, but anyone younger than that needs more assistance. For this reason, if you're visiting with very young ones then cut down on the bags as much as possible and expect to carry them up and down at least some of the face ladders. There is a place to park buggies and pushchairs by the entrance on the ship itself, so if you're with non-walkers then I'd recommend a combination of pushchair and front-carrier. Decks 1 and 2 are accessible without stairs and allow access to the forecastle, forward gun turret, café, boat deck (all on deck 1) and many of the crew facilities such as the galley, laundry and the restored 'Arctic' messdecks (on deck 2). The route through the boiler and engine room is off-limits to carried children and anyone under 120 cm (4 foot) tall. The gun turret experience in the rearmost turret was a great way to start off the visit for my five-year-old and got him excited about seeing the rest of the ship. It lasts just a few minutes and simulates the noise, smoke and vibration of the turret firing while telling you about what it was like for the men who fired the guns during battles, in particular the Battle of the North Cape with the German battleship Scharnhorst. Other highlights were the forecastle on deck 1, where you can go right up to the bow of the ship, see the anchors and look back towards the forward gun turrets and the bridge. 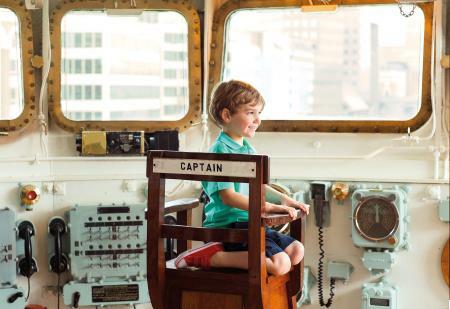 On the captain's and admiral's bridges, you can sit in the tall chairs, pretend to give orders through a microphone, and try out other bits of equipment. Also, in the map room there's an interactive game based on searching for a wrecked fighter jet during a NATO exercise (based on a real incident that the HMS Belfast was involved in). My son never found the jet, but he had fun trying! As well as the ship itself, we loved the clear views of nearby landmarks such as The Shard, Tower Bridge and the Tower of London. If you can make it all the way up to the flag deck then you'll be rewarded with even better views than you get from the main decks and a great place to watch the boats go by on the river. While my son is tall, he's below the 120cm/4ft minimum height allowed to explore the boiler and engine rooms so we weren't able to see those. 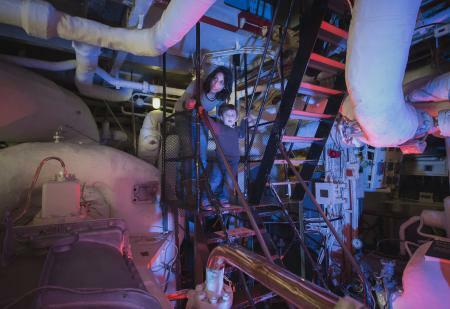 Children in Year 3 and above will be tall enough to go down into the boiler and engine rooms, so I'll be returning with my son in a couple of years as he was really keen to see those very complex and important lower parts of the ship. KS2 children also might want to take advantage of the audio tour, but if not there are plenty of signs that explain more about what you're looking at. Each of the areas that KS1s would find exciting would also have that bit more meaning to children who have started learning about World War II and D-Day, and as it's such a large ship there are sure to be new discoveries with each visit. Look out for the ship's cat, Frankenstein, 'asleep' on his own hammock in the Arctic messdecks. And, for those who really want to experience the life of sailors on board the HMS Belfast, groups of children can 'Kip in a Ship' and stay overnight, sleeping in sailors' bunks! Check out "Ship shape Saturdays" – included with the price of admission – in which you can not only learn about what it takes to keep the HMS Belfast in good condition but also help out yourself! You could be restoring fittings and furniture, caring for fabrics with specialised tools or participating in pest control. The café may look small, but it's well stocked with the basics. We spent about two hours on the ship and couldn't have made it without stopping for lunch, taking advantage of a generous "5 items for £5" deal that includes sandwiches, crisps, a drink and sweet treats. There are also cakes and hot drinks, and a continually-playing documentary about the HMS Belfast that my son was entranced by. The HMS Belfast is less than 10 minutes' walk (even with little ones in tow) from London Bridge tube station – walk towards the river, and you can't miss it. It would be a bit longer from Tower Hill, but a nice walk over the bridge. Entry is £17 for adults and £8.50 for 5-15-year-olds, or go for the range of family tickets that start at £28.90. Book online for 10% off all ticket prices. Under 5s are free. Opening hours are 10am-5pm, with last admission is at 4pm (closed 24, 25 & 26 December).. The shop is small, but there is a range of items under £10. My son gravitated towards a £9 fighter jet (with sounds, of course). At a slight splurge is the £14 soft toy Frankenstein cat. You'll find lots more about the history of the HMS Belfast on the website, including a detailed, interactive timeline of the ship's history. You can even see a video of the 1938 launch! World War II is covered in primary school in KS2.